Metronidazole, marketed under the brand name Flagyl among others, is an antibiotic and antiprotozoal medication. It is used either alone or with other antibiotics to treat pelvic inflammatory disease, endocarditis, and bacterial vaginosis. It is effective for dracunculiasis, giardiasis, trichomoniasis, and amebiasis. It is an option for a first episode of mild-to-moderate Clostridium difficile colitis if vancomycin or fidaxomicin is unavailable. Metronidazole is available by mouth, as a cream, and by injection into a vein. Common side effects include nausea, a metallic taste, loss of appetite, and headaches. Occasionally seizures or allergies to the medication may occur. Some state that metronidazole should not be used in early pregnancy, while others state doses for trichomoniasis are safe. It should not be used when breastfeeding. Metronidazole began to be commercially used in 1960 in France. It is on the World Health Organization's List of Essential Medicines, the most effective and safe medicines needed in a health system. It is available in most areas of the world. The pills are relatively inexpensive, costing between 0.01 and 0.10 USD each. In the United States, it is about 26 USD for ten days of treatment. In 2016, it was the 71st most prescribed medication in the United States, with more than 11 million prescriptions. Metronidazole is primarily used to treat: bacterial vaginosis, pelvic inflammatory disease (along with other antibacterials like ceftriaxone), pseudomembranous colitis, aspiration pneumonia, rosacea (topical), fungating wounds (topical), intra-abdominal infections, lung abscess, periodontitis, amoebiasis, oral infections, giardiasis, trichomoniasis, and infections caused by susceptible anaerobic organisms such as Bacteroides, Fusobacterium, Clostridium, Peptostreptococcus, and Prevotella species. It is also often used to eradicate Helicobacter pylori along with other drugs and to prevent infection in people recovering from surgery. Metronidazole is bitter and so the liquid suspension contains metronidazole benzoate. This requires hydrolysis in the stomach and so may be unsuitable in people with diarrhea or feeding-tubes in the duodenum or jejunum. The 5-nitroimidazole drugs (metronidazole and tinidazole) are the mainstay of treatment for infection with Trichomonas vaginalis. Treatment for both the infected patient and the patient's sexual partner is recommended, even if asymptomatic. Therapy other than 5-nitroimidazole drugs is also an option, but cure rates are much lower. Initial antibiotic therapy for less-severe Clostridium difficile colitis (pseudomembranous colitis) consists of metronidazole, vancomycin, or fidaxomicin by mouth. In 2017 the IDSA generally recommended vancomycin and fidaxomicin over metronidazole. Vancomycin by mouth has been shown to be more effective in treating people with severe C. difficile colitis. Common adverse drug reactions (≥1% of those treated with the drug) associated with systemic metronidazole therapy include: nausea, diarrhea, weight loss, abdominal pain, vomiting, headache, dizziness, and metallic taste in the mouth. Intravenous administration is commonly associated with thrombophlebitis. Infrequent adverse effects include: hypersensitivity reactions (rash, itch, flushing, fever), headache, dizziness, vomiting, glossitis, stomatitis, dark urine, and paraesthesia. High doses and long-term systemic treatment with metronidazole are associated with the development of leucopenia, neutropenia, increased risk of peripheral neuropathy, and central nervous system toxicity. Common adverse drug reaction associated with topical metronidazole therapy include local redness, dryness and skin irritation; and eye watering (if applied near eyes). Metronidazole has been associated with cancer in animal studies. Metronidazole is listed by the US National Toxicology Program (NTP) as reasonably anticipated to be a human carcinogen. Although some of the testing methods have been questioned, oral exposure has been shown to cause cancer in experimental animals and has also demonstrated some mutagenic effects in bacterial cultures. The relationship between exposure to metronidazole and human cancer is unclear. One study [full citation needed] found an excess in lung cancer among women (even after adjusting for smoking), while other studies [full citation needed] found either no increased risk, or a statistically insignificant risk. Metronidazole is listed as a possible carcinogen according to the WHO International Agency for Research on Cancer. A study in those with Crohn's disease also found chromosomal abnormalities in circulating lymphocytes in people treated with metronidazole. Consuming alcohol while taking metronidazole has long been thought to have a disulfiram-like reaction with effects that can include nausea, vomiting, flushing of the skin, tachycardia, and shortness of breath. People are typically advised not to drink alcohol during systemic metronidazole therapy and for at least 48 hours after completion of treatment. However, some studies call into question the mechanism of the interaction of alcohol and metronidazole, and a possible central toxic serotonin reaction for the alcohol intolerance is suggested. Metronidazole is also generally thought to inhibit the liver metabolism of propylene glycol (found in some foods, medicines, and in many electronic cigarette e-liquids), thus propylene glycol may potentially have similar interaction effects with metronidazole. It also inhibits CYP2C9, so may interact with medications metabolised by these enzymes (e.g. lomitapide, warfarin). Metronidazole is of the nitroimidazole class. It inhibits nucleic acid synthesis by disrupting the DNA of microbial cells. This function only occurs when metronidazole is partially reduced, and because this reduction usually happens only in anaerobic bacteria and protozoans, it has relatively little effect upon human cells or aerobic bacteria. Metronidazole is widely used to treat infections of Giardia in dogs, cats, and other companion animals, although it does not reliably clear infection with this organism and is being supplanted by fenbendazole for this purpose in dogs and cats. It is also used for the management of chronic inflammatory bowel disease in cats and dogs. Another common usage is the treatment of systemic and/or gastrointestinal clostridial infections in horses. Metronidazole is used in the aquarium hobby to treat ornamental fish and as a broad-spectrum treatment for bacterial and protozoan infections in reptiles and amphibians. In general, the veterinary community may use metronidazole for any potentially susceptible anaerobic infection. The U.S. Food and Drug Administration suggests it only be used when necessary because it has been shown to be carcinogenic in mice and rats, as well as the microbes for which it is prescribed, and resistance can develop. ^ a b c d e f g "Flagyl, Flagyl ER (metronidazole) dosing, indications, interactions, adverse effects, and more". Medscape Reference. WebMD. Archived from the original on 7 April 2014. Retrieved 3 April 2014. ^ a b c d e Brayfield, A, ed. (14 January 2014). "Metronidazole". Martindale: The Complete Drug Reference. Pharmaceutical Press. Retrieved 3 April 2014. 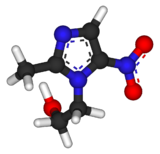 ^ a b c d e f g h i "Metronidazole". The American Society of Health-System Pharmacists. Archived from the original on September 6, 2015. Retrieved July 31, 2015. ^ a b c McDonald, LC; Gerding, DN; Johnson, S; Bakken, JS; Carroll, KC; Coffin, SE; Dubberke, ER; Garey, KW; Gould, CV; Kelly, C; Loo, V; Shaklee Sammons, J; Sandora, TJ; Wilcox, MH (15 February 2018). "Clinical Practice Guidelines for Clostridium difficile Infection in Adults and Children: 2017 Update by the Infectious Diseases Society of America (IDSA) and Society for Healthcare Epidemiology of America (SHEA)". Clinical Infectious Diseases. doi:10.1093/cid/cix1085. PMID 29462280. ^ a b "Metronidazole Use During Pregnancy | Drugs.com". www.drugs.com. Archived from the original on 1 January 2017. Retrieved 1 January 2017. ^ Corey, E.J. (2013). Drug discovery practices, processes, and perspectives. Hoboken, N.J.: John Wiley & Sons. p. 27. ISBN 9781118354469. Archived from the original on 2017-09-08. ^ Schmid G (28 July 2003). "Trichomoniasis treatment in women". Archived from the original on 1 August 2015. Retrieved 1 August 2015. ^ "Sources and Prices of Selected Medicines and Diagnostics for People Living with HIV/AIDS". World Health Organization. 2005. Archived from the original on 29 January 2016. Retrieved 1 August 2015. ^ Mandell, Douglas, and Bennett's Principles and Practice of Infectious Diseases (8 ed.). Elsevier Health Sciences. 2014. p. 2753. ISBN 9780323263733. Archived from the original on 2017-09-08. ^ a b c d e f Rossi, S, ed. (2013). Australian Medicines Handbook (2013 ed.). Adelaide: The Australian Medicines Handbook Unit Trust. ISBN 978-0-9805790-9-3. ^ Joesoef, MR; Schmid, GP; Hillier, SL (Jan 1999). "Bacterial vaginosis: review of treatment options and potential clinical indications for therapy". Clinical Infectious Diseases. 28 Suppl 1: S57–65. doi:10.1086/514725. PMID 10028110. ^ Dubouchet, L; Spence, M. R.; Rein, M. F.; Danzig, M. R.; McCormack, W. M. (1997). "Multicenter comparison of clotrimazole vaginal tablets, oral metronidazole, and vaginal suppositories containing sulfanilamide, aminacrine hydrochloride, and allantoin in the treatment of symptomatic trichomoniasis". Sexually transmitted diseases. 24 (3): 156–60. doi:10.1097/00007435-199703000-00006. PMID 9132982. ^ Leitsch, David (September 2015). "Drug resistance in the microaerophilic parasite Giardia lamblia". Current Tropical Medicine Reports. 2 (3): 128–135. doi:10.1007/s40475-015-0051-1. PMC 4523694. ^ Zar, F. A.; Bakkanagari, S. R.; Moorthi, K. M.; Davis, M. B. (2007). "A comparison of vancomycin and metronidazole for the treatment of Clostridium difficile-associated diarrhea, stratified by disease severity". Clinical Infectious Diseases. 45 (3): 302–7. doi:10.1086/519265. PMID 17599306. ^ Shennan, A.; Crawshaw, S.; Briley, A.; Hawken, J.; Seed, P.; Jones, G.; Poston, L. (2005). "General obstetrics: A randomised controlled trial of metronidazole for the prevention of preterm birth in women positive for cervicovaginal fetal fibronectin: The PREMET Study". BJOG: An International Journal of Obstetrics and Gynaecology. 113 (1): 65–74. doi:10.1111/j.1471-0528.2005.00788.x. PMID 16398774. ^ a b Karamanakos, P.; Pappas, P.; Boumba, V.; Thomas, C.; Malamas, M.; Vougiouklakis, T.; Marselos, M. (2007). "Pharmaceutical Agents Known to Produce Disulfiram-Like Reaction: Effects on Hepatic Ethanol Metabolism and Brain Monoamines". International Journal of Toxicology. 26 (5): 423–432. doi:10.1080/10915810701583010. PMID 17963129. ^ Karamanakos, P. N. (2008). "The possibility of serotonin syndrome brought about by the use of metronidazole". Minerva Anestesiologica. 74 (11): 679. PMID 18971895. ^ a b c d "Metronidazole CAS No. 443-48-1" (pdf). Report on Carcinogens, Twelfth Edition (2011). U.S. Department of Health and Human Services, Public Health Service, National Toxicology Program. Archived (PDF) from the original on 2011-10-18. Retrieved 2011-10-28. ^ a b "Metrogyl Metronidazole Product Information" (PDF). TGA eBusiness Services. Alphapharm Pty Limited. 8 May 2013. Archived from the original on 9 September 2016. Retrieved 3 April 2014. ^ Bendesky, A; Menéndez, D; Ostrosky-Wegman, P (June 2002). "Is metronidazole carcinogenic?". Mutation Research. 511 (2): 133–44. doi:10.1016/S1383-5742(02)00007-8. PMID 12052431. ^ "Flagyl 375 U.S. Prescribing Information" (PDF). Pfizer. Archived from the original (pdf) on 2008-08-07. ^ International Agency for Research on Cancer (IARC) (May 2010). "Agents Classified by the IARC Monographs, Volumes 1–100" (PHP). World Health Organization. Archived from the original on 2011-06-11. Retrieved 2010-06-06. ^ Chen, K. T.; Twu, S. J.; Chang, H. J.; Lin, R. S. (2003). "Outbreak of Stevens-Johnson Syndrome / Toxic Epidermal Necrolysis Associated with Mebendazole and Metronidazole Use Among Filipino Laborers in Taiwan". American Journal of Public Health. 93 (3): 489–492. doi:10.2105/ajph.93.3.489. PMC 1447769. PMID 12604501. ^ Cina, S. J.; Russell, R. A.; Conradi, S. E. (1996). "Sudden death due to metronidazole/ethanol interaction". The American Journal of Forensic Medicine and Pathology. 17 (4): 343–346. doi:10.1097/00000433-199612000-00013. PMID 8947362. ^ Gupta, N. K.; Woodley, C. L.; Fried, R. (1970). "Effect of metronidazole on liver alcohol dehydrogenase". Biochemical Pharmacology. 19 (10): 2805–2808. doi:10.1016/0006-2952(70)90108-5. PMID 4320226. ^ Visapää, J. P.; Tillonen, J. S.; Kaihovaara, P. S.; Salaspuro, M. P. (2002). "Lack of disulfiram-like reaction with metronidazole and ethanol". The Annals of Pharmacotherapy. 36 (6): 971–974. doi:10.1345/1542-6270(2002)036<0971:lodlrw>2.0.co;2. PMID 12022894. ^ Eisenstein, B. I.; Schaechter, M. (2007). "DNA and Chromosome Mechanics". In Schaechter, M.; Engleberg, N. C.; DiRita, V. J.; et al. (eds.). Schaechter's Mechanisms of Microbial Disease. Hagerstown, MD: Lippincott Williams & Wilkins. p. 28. ISBN 978-0-7817-5342-5. ^ Kraft, M. Ya. ; Kochergin, P. M.; Tsyganova, A. M.; Shlikhunova, V. S. (1989). "Synthesis of metronidazole from ethylenediamine". Pharmaceutical Chemistry Journal. 23 (10): 861–863. doi:10.1007/BF00764821. ^ Barr, S. C.; Bowman, D. D.; Heller, R. L. (1994). "Efficacy of fenbendazole against giardiasis in dogs". American Journal of Veterinary Research. 55 (7): 988–990. PMID 7978640. ^ Hoskins, J. D. (Oct 1, 2001). "Advances in managing inflammatory bowel disease". DVM Newsmagazine. Archived from the original on 2013-12-31. Retrieved 2013-12-28. ^ Plumb, D. C. (2008). Veterinary Drug Handbook (6th ed.). Wiley. ISBN 0-8138-2056-1. ^ "Metronidazole". Drugs.com. Archived from the original on 2013-06-24. "Metronidazole Human Health Effects: Evidence for Carcinogenicity". TOXNET. "Metronidazole". Drug Information Portal. U.S. National Library of Medicine.